Kevin McClain and Nick Muszynski led the men’s basketball team to its first ever NCAA Tournament win with a heart-stopping 81-70 defeat over Temple University on Tuesday night in Dayton, Ohio. McClain’s presence on the court carried the team to its historic victory. He scored 29 points, two shy of his career high 31. Senior Dylan Windler was completely shut down by Temple’s defense, only scoring 5 points the entire game. But he came up huge under the net, picking up 14 rebounds and three steals. For Byrd, the best part of making the tournament was seeing McClain and Windler have the opportunity to play in the big dance, something they’d worked incredibly hard for, he said. 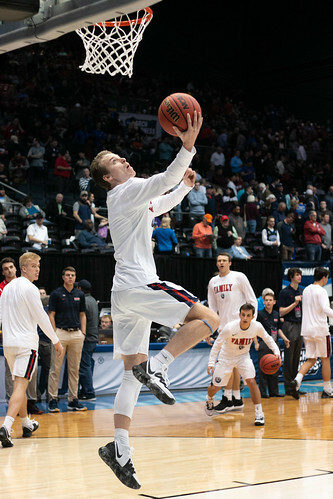 There was a lot of speculation about how well Muszynski would perform coming off of the injury that forced him to miss the OVC Tournament final, but the OVC Freshman of the Year went off in his return, scoring 16 points and blocking two shots at crucial moments. The Bruins did not make it easy on themselves, turning over the ball seven times in the first half and 11 times overall. Temple scored 15 points off of those turnovers. “Both teams had probably double figure points off of almost accidental scores it seems to me. I don’t think it’s necessarily the cleanest basketball game you’re going to see,” Byrd said. Aside from the constant turnovers, Temple senior Shizz Alston Jr. was Belmont’s biggest issue. Alston scored 21 points, 14 of which came in the second half when the game’s outcome was completely up in the air. Freshman Grayson Murphy struggled immensely throughout the entire game, turning over the ball three times and making horrible passes which clearly infuriated head coach Rick Byrd. He scored 9 points and picked up 6 rebounds and 6 assists, which helped make up for the sloppy play. Early in the first half, the Bruins led 15-8, but things quickly started to go wrong. The Owls went on a 14-2 run, giving them a 22-17 lead with a little over 11 minutes to go in the half. But a couple of quick baskets by Belmont and a McClain three gave the Bruins a 30-27 lead, which they held onto up to the end of the first half. Belmont led the Owls 37-31 going into the break. Belmont kicked off the second half with a 5-0 run, but it was stopped quickly by back-to-back turnovers which allowed the Owls to score 7 straight points. Temple caught up with Belmont and took a 50-46 lead over the Bruins, but McClain and Muszynski relentlessly fought back to give the Bruins a 67-57 lead with under four minutes left in the game. The Bruins extended that lead to 11 points, beating Temple 80-71 to earn their first ever NCAA Tournament victory. The game also took on extra significance because it was the last one for legendary Temple head coach Fran Dunphy. “He’s really one of, if not the best guy in the business and a quality man. I’m just going to miss him. I was fully prepared to be happy for him if he won this game because it’s his last year,” Byrd said. After the game, the Bruins headed to Jacksonville, Florida, where the No. 11 seeded Belmont will face No. 6 University of Maryland in their first round game on Thursday. The game is set to tip off at 1:10 p.m. Eastern time. Written by Steven Boero and Bronte Lebo. Photos by Carina Eudy.